The Bragg-Mitchell Mansion’s massive double parlors, circular staircase and rooms built on a grand scale remind your guests of a time when hospitality was a way of life. With the grace and elegance of traditional Southern entertaining, the Mansion is available for weddings, receptions, parties, showers, dinners and corporate functions. Canopied by a grove of century-old oaks and furnished with fine antiques and crystal chandeliers, the Bragg-Mitchell Mansion offers a rare glimpse of life in the Old South. When it was built in 1855, the house was the center of the lively social life of the thriving cotton port of Mobile. Today, the home is a museum offering guided historic tours. As one of the most photographed buildings in Mobile, the Bragg-Mitchell Mansion is an architectural icon representing the Old South, an image that evokes a time of gracious living and socializing. 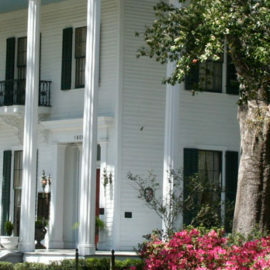 An example of Greek Revival architecture, the Mansion’s distinct floor plan and details make it stand out among historic buildings in the area.